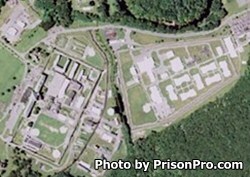 Ulster Correctional Facility is located in Napanoch New York, part of Ulster County. It is a medium security prison that houses adult males. Most of the inmates at Ulster Correctional Facility will only stay at the prison a short time. They will be processed through intake, classified and given a battery of examinations. Based on the information gathered the inmate will be assigned a more permanent facility. Usually inmates who first arrive at Ulster Correctional Facility will not be allowed to call home for several days to a week. Programs at this facility are limited due to the short incarceration period for most inmates. Visiting for Ulster Correctional Facility occurs on Saturdays, Sundays, and Holidays from 8:30am-2:30pm. You must arrive by 2pm, visitor processing ends at this time. Reception inmates have visitation on an odd/even visiting schedule that rotates (call for the current rotation). SHU inmates have visits everyday from 8:30am-2:30pm. All inmates are allowed to have a maximum of three visitors per session.